As a Friday treat we are jazzed to be revealing Laura and Scott's (Blythe's in-laws) newest room makeover...a nursery! As you know, this couple has been hard at work doing an incredible job on their living space. Well, the biggest news is that the sweetest little baby boy and Blythe's newest nephew was born in May! His name is Andrew. 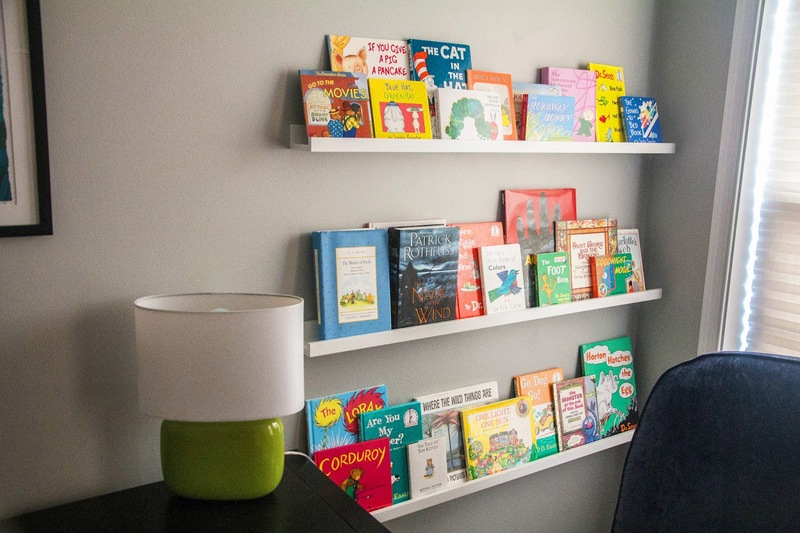 Being the responsible parents that they are, Laura and Scott finished turning what was a spare guest room into the new nursery before he was born. Laura sent us the pictures and it took our breath away at how beautiful it was but also how comfortable and approachable it was...just perfect for a nursery! 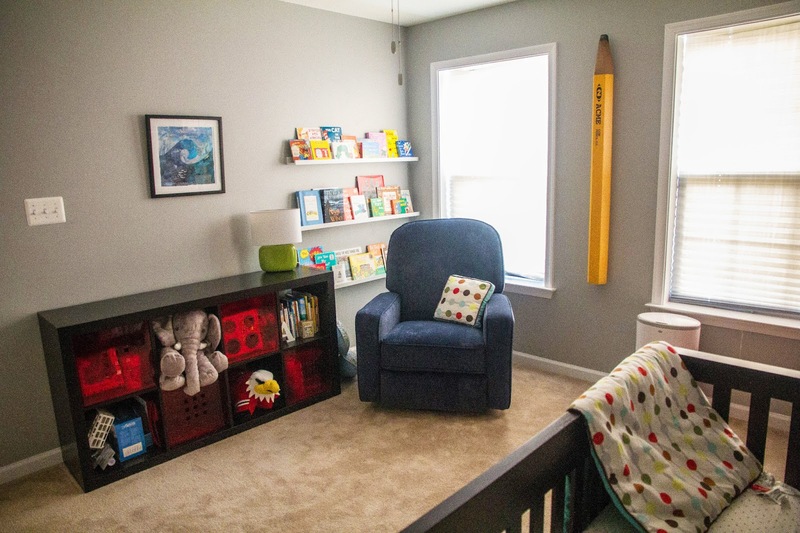 This nursery has some creative touches (like an awesome alphabet wall and a jumbo pencil) but actually looks (and Blythe can attest... feels) like a room you actually want to snuggle and play in. So wonderful. 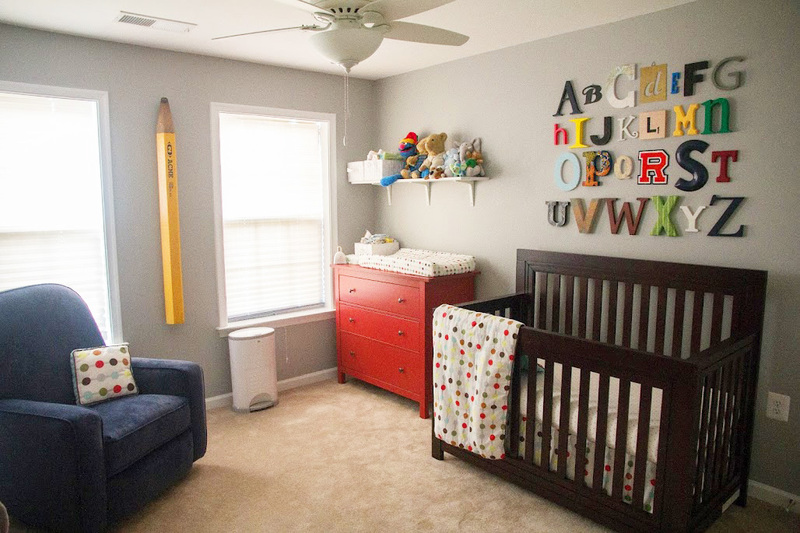 Even though we knew we were having a boy, we didn't want the room to be overly-gendered. A lot of what you see I would have done for a girl's room too (I'm not into pink and girly stuff). After all, the room is basically for us in the beginning anyway! I had seen a few of these on pinterest and really wanted to do one in my kid's room. I started by going to antique and thrift shops and buying any available letters sized 4 inches to 12 inches. Then, I went to stores that sold full alphabet sets to fill in missing letters. Toward the end, we were worried we wouldn't get a full alphabet! We had an extra "A" that we kept in the room for "Andrew"
The only thing not complete is the window treatments - these are temporary stick up blinds -- window treatments are so expensive! I hope Andrew enjoys it! Isn't it incredibly fun? Here are all of Laura's sources (with links included where possible)! Cube bookshelf: IKEA Expedit with coordinating boxes for toys. Alphabet Wall: Laura has a list of where each letter is from (!) so if you are interested, leave a comment and we'll get back to you! Thank you so much, Laura! You're an inspiration in finding that comfortable and stylish aesthetic we find oh-so important! 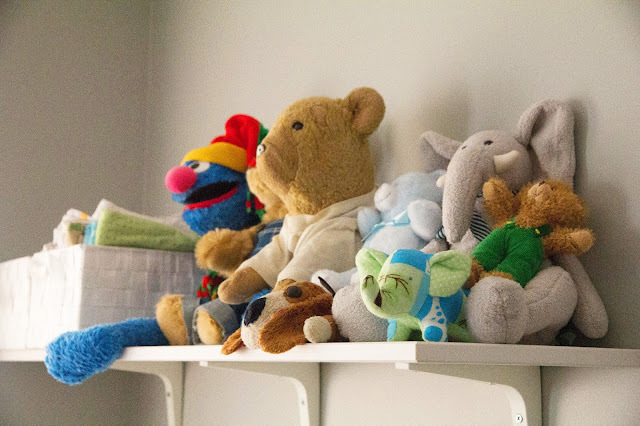 PS: Another Nursery Reveal, and another nursery-related Phone-A-Friend! Psst... Laura told us where she got EVERY ONE of those letters, so if there is one that you're interested in, just leave a comment here and we'll get back to you! Where is the scrabble letter from? Out of all the letters, that's one she made herself! 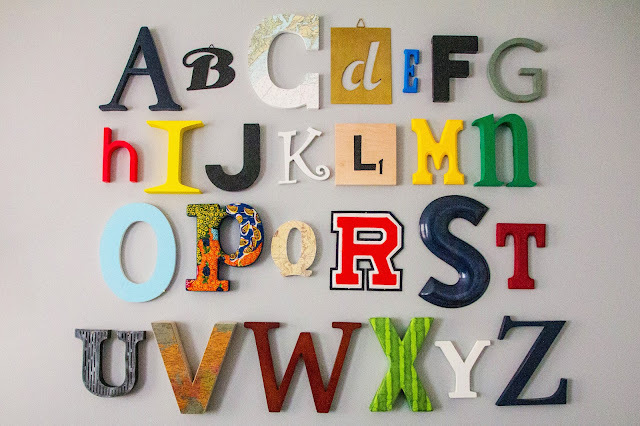 From Laura: "L: I Painted a piece of wood (that I got for free at a local hardware store from scraps) to look like a scrabble letter (easy way to fill in that last hard to find letter)"
I would love to know where you got the letters!